Alarming Findings About Hospital Monitors : Shots - Health News Alarms on various monitors ring, beep, and do just about everything short of firing off a flare to get a nurse's attention. All that noise tends to wear nurses down, and often it masks the truly important warnings. If you think the distractions from the GPS, cellphone and radio blaring inside your car are bad, spend a little time in the hospital. Alarms on various monitors ring, beep, and do just about everything short of firing off a flare to get a nurse's attention. All that noise tends to wear nurses down. The Boston Globe takes a look at the problem of "alarm fatigue" that leads nurses to ignore the warnings from patient monitors, despite their urgency. "Everyone who walks in the door gets a monitor," a nurse at Boston Medical Center tells the Globe. There are 17 kinds of alarms that can sound anytime. "They all have different pitches and different sounds," she says. In the end, though, the constant din is reduced to background noise. 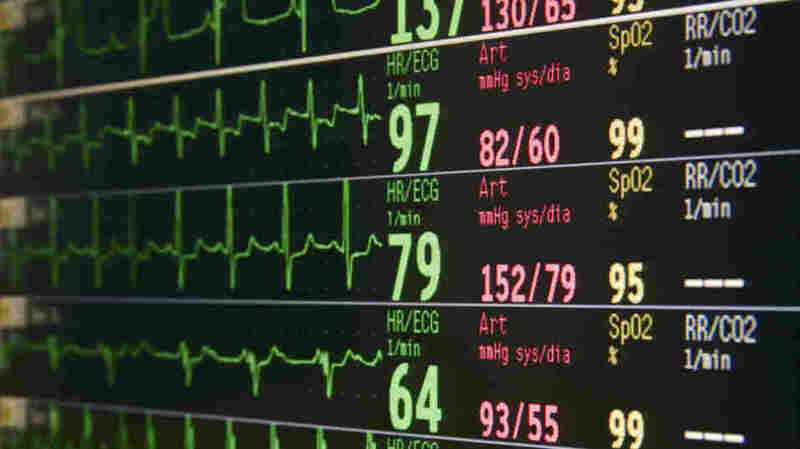 At least 200 patients died in this country because of problems with monitor alarms over a five-year period ending in 2010, the Globe story says. And that's probably on the low side. The nonprofit ECRI Institute, which helped the Globe with the analysis, put alarm problems at No. 2 in its most recent Top 10 list of health technology hazards. As a second story in the Globe explains today, finding a solution to the problem isn't easy. Fewer machines and fewer alarms might make those that do sound more noticeable. But, simply put, there's no simple fix. Even if you're not depending on a monitor to safeguard your health, a hospital can be a darned noisy place to be, as NPR's Nell Greenfieldboyce reported a few years back. Acoustics experts at Johns Hopkins found the average noise level about the same as when your neighbor is mowing the lawn.